Do you love the taste of artisan style sourdough bread? Want to learn how to make it yourself? If you answered yes to both these questions, you may wish to check out an upcoming workshop at the Trout Lake Community Centre. The lovely Valentine Kitamura of Tartine Maple will be leading a hands-on workshop on Wednesday, January 23rd. Valentine will take you through the 3 stages of dough making in this 3 hour evening class filled with tips for success. Cost is $66.67 and registration is available online. Visit Tartine Maple for more information and to register. I recently had the pleasure of attending an artisan bread making class presented by local artisan bread maker, Chris Brown, of Rise Artisan Bakery. 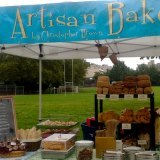 Chris sells his delicious artisan breads at the Winter Farmers Market held at Nat Bailey Stadium. He will be there in good form this Saturday, March 23rd along with his hot cross buns just in time for Easter. What is notable is that Chris also makes world class orange Seville marmalade and I do mean world class. Chris recently entered his marmalade “The Bitter End” in the World’s Original Marmalade Awards held in Penrith, England. There were over 1,500 entrants from around the world. Chris made away with the Silver Medal in the Artisan Category. I can attest that the marmalade is really that good, in my humble opinion. The award winning marmalade will also be available at this weekend’s Winter Farmers Market at Nat Bailey Stadium 10:00 a.m. – 2:00 p.m. To learn more about Rise Artisan Bakery, check out their Facebook page. Congratulations Chris!